Eels May Use 'Magnetic Maps' As They Slither Across The Ocean : The Two-Way Eels sometimes swim thousands of miles from their birthplace in the Atlantic to rivers and lakes where they live. Researchers say the creatures might use the Earth's magnetic field to find their way. Young European eels (Anguilla anguilla) are called "glass eels" at that stage because they're transparent except for a dark spine down the middle. He's one of the humans that, all these years later, is still pondering eels. No one has ever seen European or American eels, as these two species are known, spawn or collected their eggs in the wild. But it's now known that the vast majority of eels in Europe and North America are born in the same place — deep in the Atlantic Ocean in a warm spot northeast of Cuba known as the Sargasso Sea. After they're born, the baby eels make an epic journey, sometimes traveling thousands of miles to their new homes in rivers and lakes from North America to North Africa to Scandinavia. "It's pretty crazy," says Naisbett-Jones, who at the time of the study was at Aberystwyth University in the U.K. He wanted to know how those little eels do it. Other scientists had found that eels can somehow sense the Earth's magnetic field, an ability dubbed "magnetoreception" that sounds like something out of the movie X-Men. Naisbett-Jones wondered if it eels picked up on those magnetic signals to guide their long journey home. To find out, he rounded up about a thousand young European eels (Anguilla anguilla), each about the length of a pinky finger and delicate as noodles. At that stage, they're called "glass eels," because they're transparent except for a dark spine down the middle. He spent a summer wrangling those baby eels into contraptions he built that imitated the Earth's magnetic field at three points along the journey from the Sargasso Sea to Europe. The intensity and direction of that field changes with location. All day every day for about a month, he would scoop up batches of 16 eels from a tank, and place each one into the center of a little container. Then, he would turn on a magnetic coil surrounding the containers and let the eels decide where they wanted to go. They could choose between 12 chambers to swim into, like an eel version of a choose-your-own-adventure. As Naisbett-Jones and his colleagues wrote in the journal Current Biology, they found that overall, the eels did indeed respond to the magnetic fields. And they did so in a way that, had they been in the Atlantic Ocean, would have directed them into the Gulf Stream. "The eels oriented in a manner that would increase their entrainment into the Gulf Stream system," says Naisbett-Jones. When exposed to the field they'd find in the northern mid-Atlantic, and to the ambient one in Wales, where the experiment took place, they swam in random directions. But when exposed to a magnetic field like the one in the Sargasso Sea, the eels tended to orient themselves southwest. And when exposed to a field like the one they'd encounter in the northwest Atlantic, many eels pointed themselves northeast. Getting into the Gulf Stream isn't a guaranteed ride to Europe, he says, "But it certainly increases their chances of eventually finding Europe, and if an eel has a magnetic map and it's able to detect where it is, then it can adjust accordingly during its migration." "What we show here is that they're able to detect the magnetic field and use that to orient as a magnetic map. They're able to pick up on these predictable features of the magnetic field in order to gain positional information, kind of analogous to maybe a GPS positioning system," says Naisbett-Jones, who hopes to study whether adult eels use the same ability to find their way back to the Sargasso Sea years later to spawn. 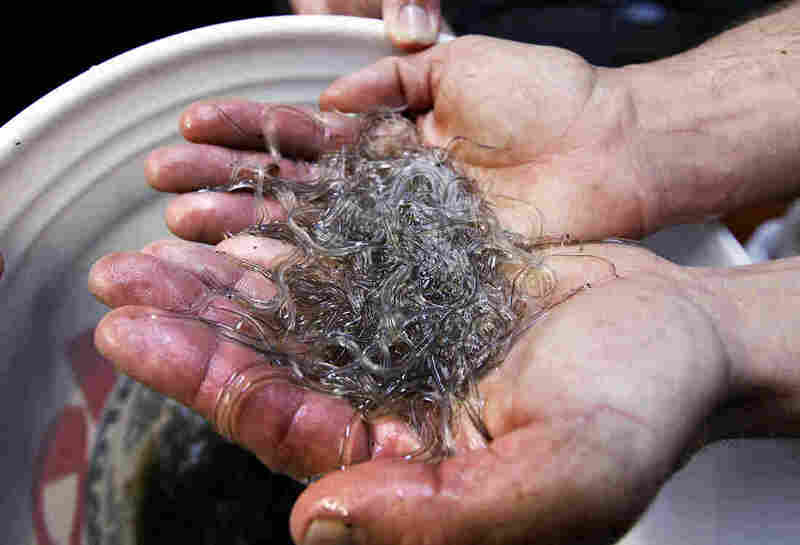 A man holds elvers, young glass eels, in Portland, Maine, in 2012. If eels really do navigate this way, then they join a long list of animals including sea turtles, salmon and homing pigeons that rely on what biologist James Gould calls "innate magnetic coordinates." Researchers and the military have long been interested in this type of navigation as a potential alternative to navigation systems that rely on satellites. "The magnetic-based 'map' has been found in amphibians, fish, reptiles, birds, and aquatic mammals," James Gould, a biologist affiliated with Princeton University, told NPR in an email. Some species use additional cues such as odors to supplement the magnetic ones. "The use of a grid of total magnetic intensity vs. vertical intensity seems to be evolutionarily quite ancient," says Gould, who has investigated animal navigation in his own research and in the process of co-writing a book on the topic. What's particularly interesting about eels, he says, is not necessarily their ability to sense magnetic fields, but how that ability may have affected them over the years. 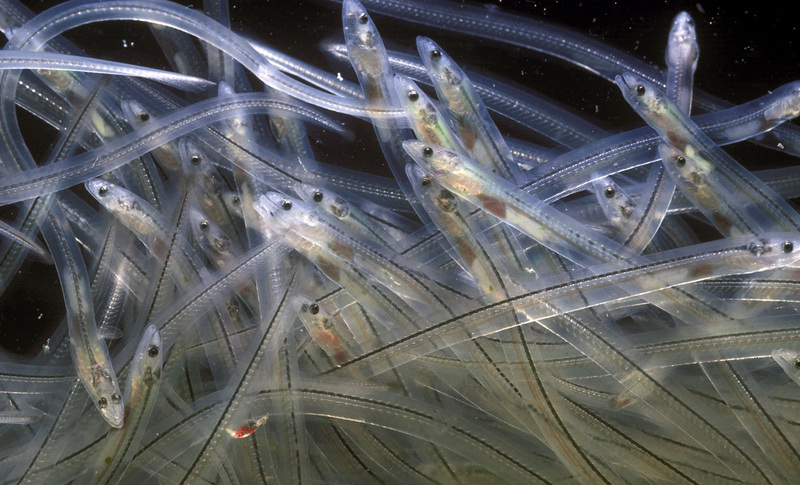 "Eel migration eons ago was quite short — perhaps only a few tens of miles. But as the Atlantic basin has spread, their journey has gotten longer and longer," Gould says. "They are trapped in an absurdly long journey by their reliance on this otherwise wonderful 'map.' "
Now, each year, that magnetic sense launches every young eel on a slithery version of the Odyssey. Earlier broadcast and Web versions of this story said eel eggs had never been collected in the wild. University of Tokyo researchers first collected Japanese eel eggs in the wild for a study from 2005 to 2009.